I talk to Twin Fin's Paul Wickerson and Dana MacCabe about the band, how they write songs and their new album Whiskey Wine and Venom Love. 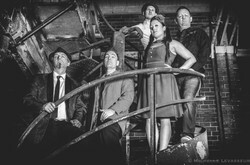 Twin Fin takes swing, rockabilly, blues and jazz and forges them into a unique sound. The band's lead guitarist Paul Wickerson and their singer Dana MacCabe talk about the band's approach to music and their latest album Whiskey Wine and Venom Love. The roots of Twin Fin lie in a band project that Paul has been a part of for many years. He says, "Originally I was playing straight up rockabilly and that band had members coming and going. I'm the last surviving member of that original band. For years we'd been picking up these amazing players so what happened was that I invited Cole to play some sax and Dana to front the new band and take it in a new direction. We've solidified things by adding Brad on drums and Eric on bass so we're all set to go." The influences that Paul brings to the band run the gamut from swing to jazz with stops in the territory of rockabilly along the way. One of Paul's earliest influences was Brian Setzer. Paul explains, "He was the first player I saw live and I wanted to be able to play like him." He adds, "I grew up in Windsor so I heard all of the music coming out of Detroit. I love all sorts of styles. When it came time to be creative, and write something new or bring something out in the music, it just seemed obvious that the rockabilly, the swing and a little bit of jazz is what came out." Dana’s background is much more in the rock vein but she says, "When it came to playing in a band like this, it wasn't a style that I'd ever explored before. I'd done some covers with other people doing rockabilly and I've always enjoyed retro music from lots of different eras and genres. This band is exciting, I've always wanted to play in a band that had a sax player! The way that i'm singing in this band is not how you'd stereotypically think of a swing singer. I've put my own twist on it." The band's core songwriters are Paul and Cole. They work out the main arrangements, chord progressions and song lyrics. Paul says, "All of those things get worked on at rehearsals, the songs get presented and everybody has the freedom to bring their own ideas to the table. The song starts out as one thing and always morphs into something better than the sum of its parts." He discusses the actual process of writing a song from his perspective and says, "If I'm sitting down and writing a song, I try to paint a mental picture first. It could be a real event that I've witnessed or trying to create the mood of a time or place. For example, we played a New Year's Eve show at this great little club called The Night Owl. I remember looking out and seeing all of these Roller Derby girls and they were having a time and partying it up. That idea became Devil Girl Stomp." Once the songs are written, it's up to Dana to interpret them. She says, "The lyrics and the topics of the songs that those guys write are so relatable and I'm able to take them and make them my own. Who hasn't had a bad relationship or a good time out with their friends?" Whiskey Wine and Venom Love started life as a collection of songs that got good audience response at their live shows. Paul explains, "Eventually people would be singing back lyrics, so we knew we had a good collection. When we had ten good songs, it was time to make the record. Our catchphrase for the album is ten songs of gin soaked deception, debauchery and determination." Once they were ready to record, Paul points out, "We got together and hammered out the songs, so that everybody knew their parts. When it came time to go into the studio and start laying it down, I laid down all of the guitar parts in one weekend. Basically Friday and Saturday we did all of the rhythm tracks and Sunday I laid down the leads. We could have recorded it live off the floor but we had the time to do it differently so why not do it?" Dana continues, "Cole did all of the recording at his studio which meant we could take as long as we needed for this project since we weren't paying somebody separately. The band invested in the project themselves. There was very little speaking that Cole did with me. I was free to do what I wanted and it was a great experience for me." The album was made with the intent of being a reflection of Twin Fin's live show. Paul says, "We want the same energy and the same sound as a live show. There was minimal double tracking, so the album's pretty close to how we are live." The band's future plans include recording a new album for which Paul and Cole are already working on new songs as well as doing more touring. Paul says, "We made our first step onto the festival circuit this summer with some shows and the push is definitely to get a bigger presence and stretch our boundaries a bit to keep our profile up." Paul once worked in label management for the music industry, so he can speak to how the industry has evolved. He says, "The bottom fell out of the music industry when digital hit around 2003. Now independent music is driving the Canadian music industry. Even the major labels know this is true. The change happened about a decade ago and it's going strong. We wanted to embrace the digital age because it's a great way to connect with fans but you have to support that with shows as well. Overall the independent scene is going strong!" The inspiration for Twin Fin to keep playing comes from their live shows. Paul says, "I've had people come up and tell me that they hadn't heard this particular guitar sound for 30 years in a club. There's something that we do that connects with people on some level and makes them want to come up and say hey. That's really rewarding for me." Dana adds, "Playing live is what I love to do. All of the problems in life can be put aside while we're on stage and just doing what we want. Seeing people in the audience feeding off of what we're doing and having a great time as well is really what it's all about." For more information on Twin Fin, please visit their website here. This band profile is based on a telephone interview conducted and recorded with Dana MacCabe and Paul Wickerson on Sept. 7, 2016. If Aretha Franklin was the lead singer of The Allman Brothers it gives you an idea of the explosive musical styling of Alabama Shakes.